In the world of car paint jobs, lowriders take the crown for the most meaningful ones. Many tell the life stories of their owners — and if the owner is a Chicano, the story will likely be a brave and proudly defiant one. (See the L.A. car-culture plots in the movie Lowriders to get an idea.) So we talked to a few real lowriders about the cultural inspiration for their car’s unique motif. The symbols and murals on lowriders aren’t just random things that look badass. In the 1940s, lowriders originated as a political and social statement made by Mexican immigrants in the face of acute racism. Nowadays lowriding is a worldwide sport, with countries including Thailand and Brazil running massive car shows, and Japanese aficionados painting Mexican flags on their lowriders. But Chicano art remains the backbone of the movement. “Everybody has their own, different taste. No lowrider is the same,” says Willy Moreno, one of the 12 members of New York City’s Lunatics Lowrider Club. He’s had his 1984 Cadillac Fleetwood Brougham for 16 years and religiously goes cruising through the city. Along with the individuality of each lowrider comes a lot of patience and dedication. Owners have much to ponder before choosing a paint job: get the painter to mix a unique color no one else has; debate between flakes, candy, and pearl colors; make sure the color combo matches; and nail a pattern that coincides with the model’s year, while leaving space for a mural. The symbols and murals on lowriders aren’t just random things that look badass, either: For example, flames are largely unpopular, because they relate to hot rods, a lowrider’s polar opposite (hot rods go fast, obviously, whereas lowriders go “bajito y suavecito” [low and slow]). 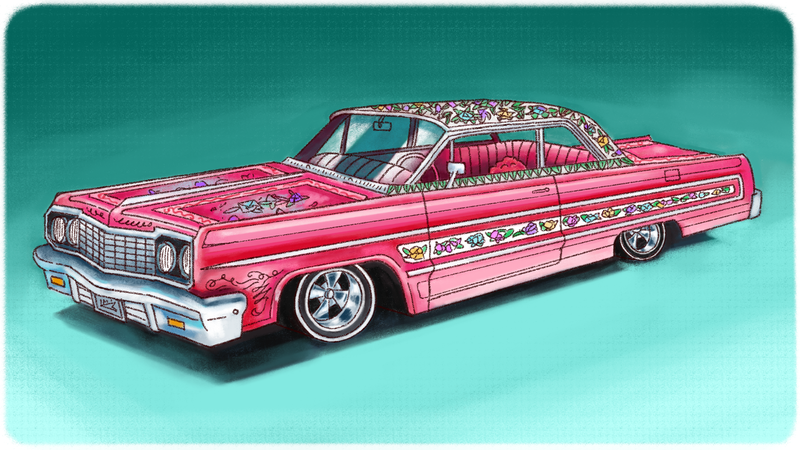 Of course, you can’t talk about Chicano paint jobs without mentioning the most famously painted lowrider ever: an iconic pink 1964 Chevy Impala named Gypsy Rose. Its revered owner, Jesse Valadez, founder of the well-known Imperials Car Club, passed away in 2011, and was buried in a casket that matched his ride. Gypsy Rose is covered in painted roses that were inspired by the floral patterns on walls in Mexican restaurants. The car broke into the mainstream when it began appearing in the introduction of the 1970s NBC sitcom Chico and the Man. Today this legendary lowrider is cared for by Valadez’s son, and continues to represent Mexican pride. You can get a full immersion into lowrider paint jobs and cruising culture starting May 12th, when Lowriders, starring Melissa Benoist, Theo Rossi, and Eva Longoria, hits theaters. This post is a sponsored collaboration between Lowriders and Studio@Gizmodo.